I made my belt grinder with a two-wheel flat platen, and then built up a set of small wheels and tool attachment for them. So far, I am very happy with the results. One thing I have been longing for is big contact wheel. The heart of this project is of course the wheel, which is a Grizzly 10" replacement wheel from their 2 x 72" belt grinder. It's very reasonable at $76 US, but has a small problem. It's meant to be secured directly to the prime mover. In other words it doesn't come with bearings and there are no machined provision for bearings. This puppy was meant to be locked on to the shaft of the motor that turns it. I discussed this with my machinist friend and the prospects of machining places for a sealed bearings was going to be a little on the expensive side. Something about chucking it from the outside. Well, machine shops are not cheap and a lathe I do not have. The trick will be to press a shaft in and build up some suitable bearings for the wheel spin freely on. Once again, Alaskabearhawk shows how he did it. Some 3/4" shaft and some pillow blocks inspired me build something that plugs into the BG-272, with only a few hours of tinkering. A trip to the Metal Supermarket was fruitful. The sell 0.75" D.O.M. (Drawn Over Mandrel) tubing with 0.125" wall which should make a suitable shaft. A piece of 3/4" 4130 aircraft tubing would also work, but I couldn't locate that as easily as D.O.M. tubing. Two 3/4" pillow blocks will keep everything rolling along. If you are curious, these bearings are inexpensive, like under $10 each, have a Zerk grease fitting and can handle a radial load of 2000 lbs. and an axial load of 1100 lbs. In other words, way overkill for this application, but over engineering is good right? This is the basic arrangement of items that we'll have to buy or make. It should be noted that for my application my machine I needed to increase the spacers to 1.25". 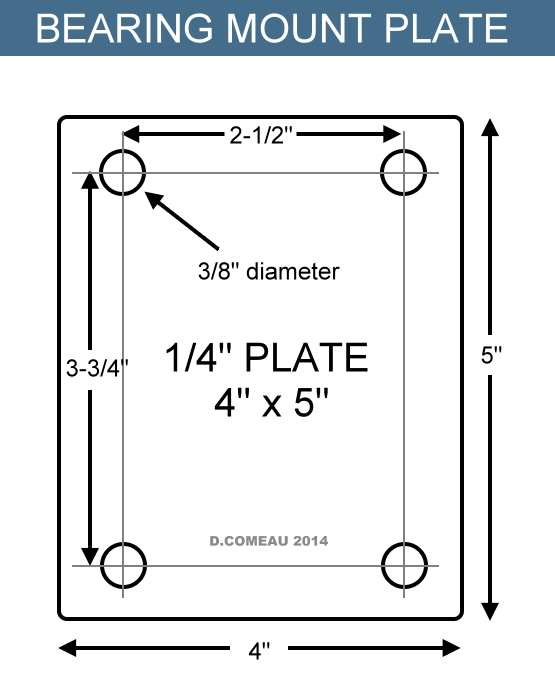 A steel plate (4" x 5" x 1/4") and two 3/4" pillow blocks. I rounded the corners on the plate and took any sharp edges off. This is the 3/4" D.O.M. tube. I shined this a wee bit with sandpaper. I pressed one end of this tubing into the hole in the wheel. It is interference fit, so takes a bit of force. I used a hydraulic shop press for this step. Good old 1-1/2" H.S.S. square. The heavy wall (3/16") will give some solid support for the wheel. I bought 18" at Metal Supermarkets when I bought the D.O.M tube. Turns out that 18" is perfect for my machine. You'll have to size up to fit your grinder. This is how I drilled the holes for the pillow blocks. After marking and punching, the holes were drilled on the slowest speed on the drill press with a 3/8" bit and some Parks cutting fluid. Test fitting the shaft through the pillow blocks. For a spacers over the shaft I'll use some 3/4" schedule 40 galvanized pipe. These will allow us to put a large bolt or threaded rod through the whole assembly and be able to tighten it down without stressing the bearings. I used a tubing cutter to get this started nice and true. The locking collar has to go on before the next spacer and bearing go on. I trimmed a 1/2" x 8" bolt down to 7-1/4" to make a good fit. We don't really want a spinning bolt sticking out more than necessary. Threaded rod would work here as well. After some paint the two metal pieces look pretty good. This is the wheel on the grinder before alignment. After some slight adjustment (loosen the bolts twist, nudge it over and tighten the bolts again) it's running true. This is the view of the underside. If you wanted to flip the whole bearing assembly and mount it on the top of the tool arm you can. This would raise the wheel about 4". Note: I used carriage bolts in case that nice smooth look was required. Use whatever you like for bolts. 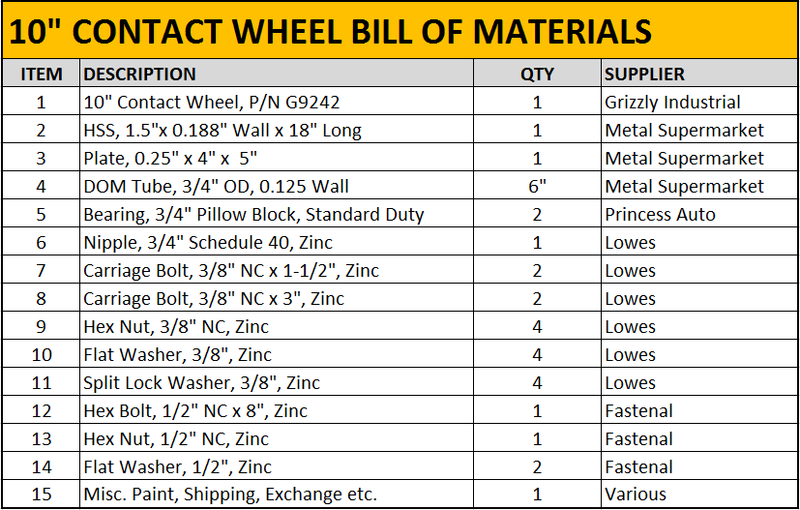 It would be great to hear from you if you make your own contact wheel. It's great being local...I can get the same stuff. THANKS for taking the time to document and post this Dan ! I'm hoping to build a grinder soon. I have one question. Can you still use a tool rest with this setup? The adjustable tool rest that I use on the flat platen will not work with the large wheel as the right pillow block interferes. You could however fashion a tool rest that mounts on the front bolts of the pillow blocks. This is a Norax engineered abrasive belt made by Norton. I bought them from Canadian Knifemaker Supply, but there are a lot of abrasive suppliers that carry Norax like Tru-grit and USAknifemaker.com. Hello again, Metal Supermarket is only offering me 3/4 with a 0.120 center. Will that work? If I read this correctly, that would be 0.75 - 0.12 - 0.12 = 0.51 which will be fine. Hello again, I had to hammer the rod through the pillow blocks but it wont go through. It became stuck. They are all 3/4 inc. what am I doing wrong? Hello again, I bought everything you listed. But, how can I put a 3/4 inch spacer on the 3/4 rod? The rod will not fit through the 3/4 inch pillow blocks either. I'm not sure what I am doing wrong. Any help will be greatly appreciated. Mark, The DOM tubing is very precise yet likely has a little mill scale on it. Clean it with some fine sandpaper or steel wool. Check the outer dimension with a caliper. It should be very close to 0.75". The DOM tube needs to fit inside the bearing inner races. 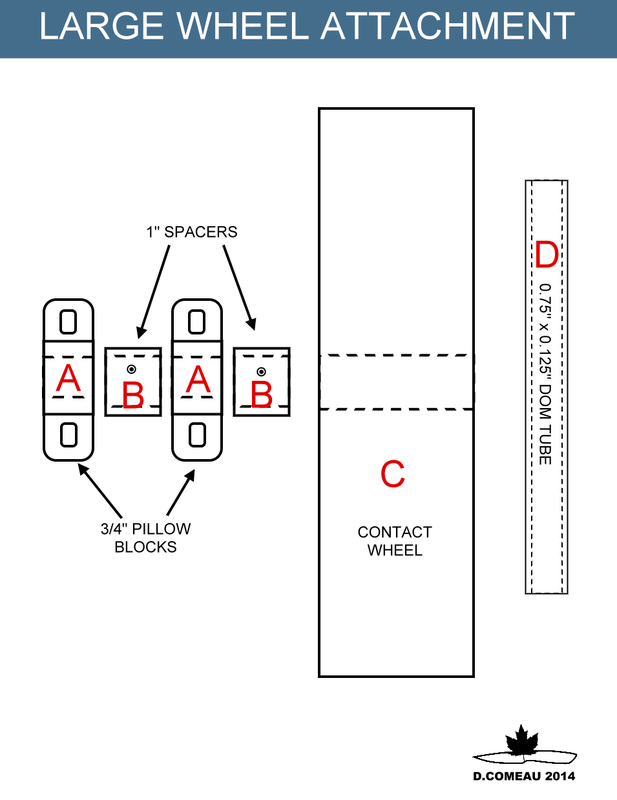 Make sure the two pillow blocks are not bolted down tight, loosen them a bit. Apply some lubricant if necessary. The spacer is schedule 40 pipe, which has different dimensions than DOM tube. Pipe measurements are based on the inside of the pipe vs. the outside for tubing. The inside dimension will be closer to 0.825". This is large enough for the DOM tube's 0.75" to easily fit through. I made This design with a quarter inch thread bolt going through the whole thing the Bolt continue to comes loose every time I Turn it on. I've added two nuts on each side and it still comes loose every time I turn it on can you please help. Dan, would you please work on a DIY surface grinding attachment? Thanks! I may set my sights on that in the spring. I have backlog of knives to catch up on and only so many hours in a day. Thanks for reminding me. Hi Dan - just getting into the knife making world as my three sons, 14,12,10 all want to make their own knives. That being said I'm learning a ton from your blog. One question though - what do you use the 10" wheel for in the knife making process as opposed to the regular platten/two wheel setup? 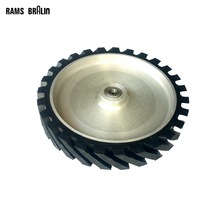 The large contact wheel is used for general purpose grinding as well as hollow grinding (making a concave in the blade).